Be the first to share your favorite memory, photo or story of Laurianne. This memorial page is dedicated for family, friends and future generations to celebrate the life of their loved one. 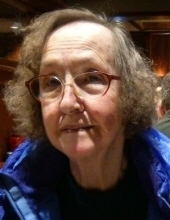 Laurianne Gunhouse, 79, of Findlay, passed away at 3:50 a.m. Friday January 25, 2019 at Brookdale of Findlay. She was born on January 6, 1940 in New Brunswick, Canada to Romuald and Martha (Lebel) Gagnon. She married Raymond Vincent Gunhouse, they later divorced and he survives in Findlay. Also surviving are three children, Norma Patricia Gunhouse, Canada, Steven Vincent Gunhouse, Findlay and Alan David (Emelita) Gunhouse, Fostoria; grandson, Charlie Griffin, Canada; sisters, Patricia (Pete) Spear and Marie Conolley. She was preceded in death by her parents and three other siblings. Laurianne served in the Canadian Royal Air Force and was a homemaker. Graveside services will take place at 10:00 a.m. Tuesday February 5, 2019 at Fountain Cemetery, Fostoria, with Rev. Todd Dominique presiding. Memorials are suggested to the Brookdale of Findlay Resident Activities Fund. To send flowers or a remembrance gift to the family of Laurianne Gunhouse, please visit our Tribute Store. "Email Address" would like to share the life celebration of Laurianne Gunhouse. Click on the "link" to go to share a favorite memory or leave a condolence message for the family.